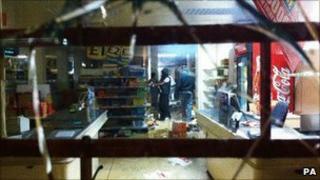 Tottenham riot: Did police get their tactics right? Police have dismissed accusations that they stood by and watched people loot during the riots in Tottenham - but what should they do in this situation? When 300 people gathered for what was supposed to be a peaceful demonstration outside Tottenham police station, few could have imagined the scenes of violence and vandalism that would unfold later that night. But hours later blazing buildings and cars turned the sky above the north London district red, and widespread looting was clear for all to see. On Sunday the disorder spread to other parts of the capital, including Brixton in the south and and Walthamstow to the east. "I saw scores and scores of people running down my street with TV sets, computers and laptops. People had TVs in trolleys and they littered the streets with electronic packaging," Tottenham Hale resident "Asif" told the BBC. "There were looters everywhere and I couldn't see a single police car in my street or surrounding areas." "Matt" described seeing people attacking police but said "they were just standing there, taking all the violence head-on". Deputy Prime Minister Nick Clegg called the rioting "opportunistic theft" but UKIP leader Nigel Farage tweeted: "Seeing pictures of looting whilst the police do nothing is frankly astonishing. That's not protesting, that's stealing." Diane Abbot, MP for neighbouring Hackney, said she was "astonished" and "marvelled" at the fact the looting had been allowed to carry on for hours, and Tottenham MP David Lammy said "something went wrong in the policing". Others said they did not know how or why the violence had spread so quickly and questioned whether police had done enough to prevent the ensuing chaos. The Metropolitan Police deputy assistant commissioner defended the police response and said the violence escalated "incredibly quickly". Image caption Home Secretary Theresa May said police had "put themselves in harm's way to protect Londoners"
"The violence that erupted ended up with retail outlets being looted, with fires, with local businesses being attacked," said Commander Steve Kavanagh. "We got as many officers there as quickly as we could, last night we got three times more officers out and tonight there will be more officers. "This criminality - these people using an excuse to go and rob local businesses, to destroy local livelihoods - will not be tolerated." A Met spokesman added that it has contingency plans to deal with disorder but would not discuss specific tactics. "We have officers available as necessary to deal with any contingency," the spokesman said. But how should police deal with a riot and its aftermath? Peter Waddington, who has studied policing and public order for 30 years, said it was a very fine balancing act. He said the key conundrum for police is always whether to contain the situation in a stand-off or whether to disperse trouble-makers. At the weekend, he said, police did "as well as you would reasonably expect" by standing back. "If they [rioters] continue to attack and potentially destroy business premises it may, on balance, be better to allow them to continue to do that without scattering them because they are likely to do more damage somewhere else," said Professor Waddington of Wolverhampton University. But former Scotland Yard commander Roy Ramm said that did not come into play in this situation. He said police had simply not expected the level of violence they saw following the initial protest - and there was not enough of them on the front line. "What happened on Saturday was that they were under-resourced and they didn't anticipate the levels of violence and vandalism," said Mr Ramm. "In a perfect situation you would have all the resources you need and had you had those resources on Saturday you would not have allowed looting and damage to property." He said police would have been "incredibly frustrated" at not being able to do more. "For a young police officer to stand there and have to watch as people cause wanton damage to homes and businesses and walk off with near armfuls of [goods] - it goes against the grain of everything [they believe in]," he said. But Prof Waddington said he believed this was the right course of action on Saturday. "If they [police] catch someone they have to arrest them and that means one officer is taken out of the line - sometimes it might take two or three officers to successfully arrest someone who is struggling and resisting arrest." This could result in an even worse situation, he said. When PC Keith Blakelock was murdered during the Broadwater Farm riots in 1985 he had been part of a squad trying to protect a crew of firefighters. As officers were drawn away to other incidents it left PC Blakelock and his colleagues vulnerable to attack. He was set upon and hacked to death. Innocent bystanders were also a concern, said Prof Waddington. When newspaper seller Ian Tomlinson died after being hit by a police baton during the G20 protests in London in 2009 there was a public outcry. "People always say 'You have got to be able to separate the innocent from the guilty'," said Prof Waddington. But this was very difficult, he said. "The whole thing is suffused with ambiguities and very finely-judged decisions that have to be made," he said. "There aren't any simple answers." Following the first serious riots in Brixton in 1981 senior judge Lord Scarman ran the inquiry into what happened. Prof Waddington believes one of the points he made 30 years ago is just as salient today. "Lord Scarman made the point that if the police have a conflict between maintaining the Queen's peace and enforcing the law then maintaining the peace trumps enforcing the law," said Prof Waddington. "It's also worth noting that when a police officer is sworn in as a constable the oath they take says nothing about enforcing the law. They are not duty-bound to enforce the law. "In fact all the laws that give police powers state a constable may - not will or must - may [enforce them] but that means that they must exercise judgement and that does not desert them in a riot situation."